CopperCube is the most easy to use 3D game engine and now it’s free to use. CopperCube is a 3D authoring tool for creating interactive 3D games, apps and websites, without programming developed by Ambiera. It focuses on a user friendly interface which makes it possible create 3D games very easily and Ambiera have now announced the release of CopperCube 6.0. The just released version 6.0 is a big step forward. In addition, CopperCube 6 is now free to use. Users can develop games, sell them, publish them on Steam, any App Store, any website, with the free edition. A major new version of the game engine with new features like post processing effects, new lighting system, WebGL 2 support, FBX import, and much more. In order to support the development of CopperCube, there are two editions which have a few more features: CopperCube 6 Professional and CopperCube 6 Studio Edition, which can be bought if wished. – CopperCube now comes as free edition, which includes nearly all of the features previously only available in the professional edition. – and many more smaller new features. Game maker and middleware pioneer, Silicon Studio, today releases the Xenko game engine, giving developers more options than ever before in creating projects of all sizes, from mobile games to realistic VR experiences and beyond. Xenko is free for educational use, small studios and individual users, with larger studios paying a nominal monthly fee. To celebrate the launch, Silicon Studio is offering all users access to the engine’s unrestricted Pro plan at no cost and with no registration requirements through July 31, 2017. Xenko was designed by an international team of developers, for developers. Using the latest version of C#, the open source engine features high-end realistic rendering, multithreading with support for the latest graphic APIs (Vulkan & DirectX 12), nested prefabs, particle effects, a built-in script editor and more. Compared to the beta version, the commercial release boasts major improvements including VR support – with features such as binaural audio, single pass rendering, multi-sampling anti-aliasing (MSAA), one-click VR setup – scene streaming management, a pipeline rendering editor, and light probes (a first step to global illumination), along with greatly improved stability. Xenko represents a new option for developers that want more flexibility from game engines, and this release is just the first step. Silicon Studio will continue to offer new features and updates, including a much more advanced rendering pipeline editor, a visual scripting system, and more. To celebrate the launch, Silicon Studio is introducing the Xenko Welcome Campaign, allowing unfettered access to the Pro and Personal plans without registration and at no cost until July 31, 2017. Following the conclusion of the welcome program, users that took advantage of the Pro Plan who wish switch to the Personal Plan can simply register their account and select the Personal option (studio size restrictions apply). For more details, see the campaign page. Xenko Custom – Available to accommodate teams with a variety of special needs, projects, and requirements. For full details, see the Xenko license plan page. Xenko is available for PC, and allows developers to build games for Windows, iOS, Android and Xbox One, with Supporting for other consoles coming soon. Xenko can be downloaded directly through the Xenko website. First introduced in Marmalade Platform 8.3 in March, Marmalade 2D Kit offers an advanced editor and runtime to make creation of engaging and dynamic 2D content both intuitive and fast. Marmalade Technologies’ in-house game development team, Marmalade Game Studio, makes extensive use of Marmalade 2D Kit to power the entire UI on one of their latest titles, RIZE: Zombies, currently in soft launch. “Having an editor focused on the specific needs of 2D content creation was a huge productivity boost, allowing rapid iteration and experimentation to fine-tune the UX in RIZE: Zombies,” says Laura Cheng, Producer at Marmalade Game Studio. “We are also seeing growing interest and uptake by other studios, helping us to continue to focus on the features that matter most to users,” adds Ryan Gilmour, Head of Product Management. In addition to an all-new version of Marmalade 2D Kit, Marmalade Platform 8.5 also brings official support for OpenAL, opening up opportunities for developers to add immersive 3D sound to their apps using a simple, extensible model. Rounding out Marmalade Platform 8.5, developers targeting Windows can now take full advantage of live tiles in their Marmalade apps and both new and existing Extension Development Kit users will benefit from enhanced documentation covering creating and debugging extensions. Marmalade Platform 8.5, the latest version of the Marmalade Platform, complete with Marmalade 2D Kit, is available now from the Developer area of the Marmalade website. Amazon Web Services Announces Amazon Lumberyard — a Free, Cross-Platform, 3D Game Engine Integrated with AWS and Twitch. Amazon Web Services Inc. (AWS), an Amazon.com company (NASDAQ: AMZN), today announced Amazon Lumberyard, a free, cross-platform, 3D game engine for developers to create the highest-quality games, connect their games to the vast compute and storage of the AWS Cloud, and engage fans on Twitch. Amazon Lumberyard helps developers build beautiful worlds, make realistic characters, and create stunning real-time effects. With Amazon Lumberyard’s visual scripting tool, even non-technical game developers can add cloud-connected features to a game in minutes (such as a community news feed, daily gifts, or server-side combat resolution) through a drag-and-drop graphical user interface. · Create the highest-quality games—Amazon Lumberyard helps developers build rich, engaging, world-class games—from a full-featured editor, to native code performance and stunning visuals, and hundreds of other features like performant networking, cloth physics, character and animation editors, particle editor, UI editor, audio tools, weather effects, vehicle systems, flocking AI, perception handling, camera frameworks, path finding, and more. Developers also have full access to Amazon Lumberyard source code, making it easy to customize the technology to create differentiated gameplay. · Build live, online features in minutes— Live, online games enjoy higher engagement and retention than offline games. 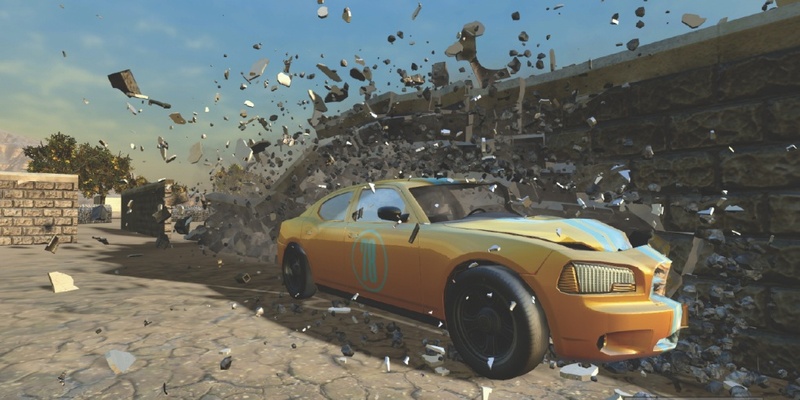 Amazon Lumberyard’s visual scripting tool, with its drag-and-drop graphical user interface, makes it easy to build connected game features that access AWS services, such as DynamoDB, Lambda, and S3. In minutes, game designers can create features such as granting a daily gift or sending in-game notifications without having to write a single line of code. Amazon Lumberyard also comes integrated with AWS’s C++ SDK to provide developers access to dozens of AWS services through native C++ code, the most common language used to make games. · Reach and engage fans on Twitch— Amazon Lumberyard is integrated with Twitch so that developers can build gameplay features that engage the more than 1.7 million monthly broadcasters, and more than 100 million monthly viewers on Twitch. With Amazon Lumberyard’s Twitch ChatPlay, developers can use a drag-and-drop visual scripting interface to create gameplay features that let Twitch viewers use chat to directly impact the game they are watching in real-time. For example, with Twitch ChatPlay within Amazon Lumberyard, a developer could build a game that lets viewers on Twitch control a character or vote on game outcomes using chat commands like “up,” “down,” “live,” or “die.” And, the Twitch JoinIn feature within Amazon Lumberyard helps developers build games that allow Twitch broadcasters to instantly invite their live audiences to join them side-by-side in the game, with a single click, while others continue to watch. Following the release of their interactive music engine psai®, Periscope Studio have released first “plug-n-play” interactive music packages in Unity Asset Store which are tailored to the psai® engine. Developers can now purchase music which already has been prepared and balanced by game audio Pros for immediate ingame use. After the release of the interactive music engine psai at the end of last year, now its makers Periscope Studio are breaking fresh ground and have released a first set of comprehensive ready-to-go interactive music packages in Unity Asset Store – all royalty free. Developers no longer have to purchase static tracks and put a lot of effort into preparing them for interactive use within their game – this was the case for any of the common audio solutions. Instead, the psai music packages’ “fully-automated” approach saves precious development time and allows them to achieve high quality interactive music results at ease. To assure AAA soundtrack quality of their interactive music packages, Periscope Studio has teamed up with the renowned Dynamedion (www.dynamedion.com ), Europe’s most successful provider for videogame music, who contributed music production to titles such as Mortal Combat X, Hitman: Absolution, The Elder Scrolls Online, Angry Birds Star Wars, Guild Wars 2, and many more. Despite the AAA quality of the interactive music, the packages do not target AAA games though. They have been created with small and mid-sized Unity games in mind, titles made by small teams who want to achieve rich gameplay quality and have limited resources at hand (no fully equipped internal audio team like the huge teams). Due to psai’s low memory footprint it is also a great choice for mobile games. This first launch includes 5 comprehensive music packages and 10 single themes – all royalty free. Each interactive music package contains 5 interactive music themes, which have been optimized to cover the needs of smaller games. In most scenarios a single package can be sufficient for a whole game. Core elements within a package are: background mood, dynamic action music and catchy main theme – all of them highly adaptive. All music themes convey automatic variation, they can easily adapt to gameplay states and events and provide musically pleasing behaviour of the music. To run the music within a game, the psai Music Engine is required. It is FREE and can also be downloaded in the Unity Asset Store. Furthermore it is worth mentioning, that psai is fully modular, music packages can be easily extended either with other music packages or single themes from Unity Asset Store or by adding own music with the psai Editor standalone application. It is part of the psai Music Engine Pro, which is currently available at Unity Asset Store at $18 (regular price: $45). “We are truly happy about the launch of our music packages in Unity Asset Store. This is something unique, it combines content and pro audio service in one product. The team put a lot of effort into preparing, testing and fine-tuning the packages. I am not exaggerating when I am saying at a click of a button developers can now have highly immersive interactive music in their games which complies to the highest professional industry standards!”, states Periscope Studio’s MD Jan Werkmeister. Havok has enjoyed a strong start to 2015 with a variety of Havok-powered titles earning the highest industry accolades, including the BAFTA Best Game Award for Destiny and the Game Developers Choice Awards Game of the Year honor for Middle-earth: Shadow of Mordor. These and other Havok-powered AAA games were acknowledged within critics and peer-voted awards ceremonies during the 2015 awards season and demonstrate a renewed and increasingly acknowledged appreciation for AAA developers in pushing the technological and design boundaries of gaming ever outward. Havok has long maintained close partnerships with the key AAA developers who have crafted some of the most indelible and critically-acclaimed titles of all time. The recent award winning games are merely a small slice of the outstanding AAA games that chose to adopt Havok technology in the past year, including Sunset Overdrive, Far Cry 4 and Dragon Age: Inquisition, titles that Havok highlight as proof of a resurgent AAA gaming segment. Alongside critical acclaim there is ample evidence of the renewed optimism being felt in the AAA gaming segment. With console hardware sales buoyant and global home console software revenue forecast to top $24bn by 2017, it’s clear that the death of AAA console gaming has been greatly exaggerated. This buoyant market validates Havok’s strategy to be the world’s leading provider of technology to the AAA game development industry. Neojac Entertainment, a Calgary-based game development company, today launched their Atavism game engine on Steam. Atavism opens up the development of 3D virtual online worlds and Massively Multiplayer Online Role Playing Games (MMORPGs) to everyone regardless of programming knowledge or artistic ability. Integrated with the Unity engine as the client, developers now have direct access to one of the highest anticipated MMORPG engines on the market. The Atavism engine received it’s greenlight from Steam late last year. It is available for $70 and can be accessed via Steam at http://store.steampowered.com/app/335930/. You can get a discount of 15% in the first two weeks on Steam. Many games are already in development using the engine, including Neojac’s own Neo’s Land, a high fantasy MMORPG that allows players to literally build the game world by creating their own dungeons, houses and other structures via the game’s unique building editor and through round table discussions with the development team. Early access to the game is available at www.neojac.com. Several other game studios are already using the Atavism engine with successful results. “We’ve used other multiplayer engines made for Unity, but nothing compared to Atavism,” said Terrence Thompson, CEO of Space Dwarves Entertainment and the creators of Bionic Marine Commander Online. “Atavism provides an ease of use and level of support that is excellent. We’ve taken our game much further in the four months using Atavism than we have in years using the other engines.” Early access for the game is available at http://bionicmarinecommand.com. Atavism also provides support for the Oculus Rift virtual reality headsets. You can learn more about Atavism at www.atavismonline.com. The middleware physics specialist, Havok, plots the future development of its newest physics platform. Back in 2003, when Havok released its first physics technology to games developers, the impact was considerable. Crates and barrels in virtual environments the world over enjoyed a new status as strategic playthings of gamers spoilt by a new way to interact. Half-Life 2 set a new standard, and in the following years physics-powered ragdolls and gravity guns became staples of contemporary game design. As the years went on, Havok and the in-game physics it championed never went away. Instead, they became standard. Then, in 2013, Havok’s reinvented physics tech found its way to studios and now, in the second half of 2014, Havok is building a new template for what physics should offer. Already it is able to have thousands of objects interacting in a realtime, interactive scene. Havok is pushing further still, ever set on bettering the impact on games. It’s what Havok’s head of product management Andrew Bowell describes as a renaissance not just for physics, but the ideas and potential to impact gameplay, parallel game systems and the creative method of environment artists. “Describing what we’re doing now as a ‘renaissance of physics’ is not to say physics in games ever went away,” he says. “It’s been our bread and butter for years. But our latest release of Havok Physics isn’t only faster, using less memory and giving higher quality results; we’re also returning to a point where it is pushing gameplay in ways not seen before. As Bowell reminisces about times when stacking ten physically controlled crates used to draw a crowd to a monitor, he and Havok field application engineer Steve Ewart show live, realtime, interactive demos of thousands of boulders tumbling down cliff sides, clattering together and gathering around the structure of a bridge, or soldiers influencing pillars of smoke with a fully automatic gun that unleashes a plume of tinned beans. The demos may at times be aesthetically absurd, but they prove a point. As Havok continues to push physics, vast interactive game worlds unlike anything seen in consumer products before are increasingly possible. And as Ewart guides a sports car through a demo environment, using its wake to gather a sea of autumn leaves into neat piles, he makes an important point. It’s immediately obvious on seeing the demos, that a huge leap forward in the number and complexity of physics controlled objects offers devs a rich toybox of ideas to plunder. “What we do must give the developer something they can use; something that informs other systems in powerful new ways,” says Bowell. The latest update for the Unity game engine has been released featuring a makeover of its 2D physics tools. Unity 4.5 includes more than 450 bug fixes and a new module manager to help bring platform-specific hotfixes across mobile platforms. The update also features improvements to 2D physics, a major update to the shader compiler, improved MonoBehaviour serialisation and added iOS support for Open GL ES 3.0. Other additions and enhancements include faster scene loading, sparse textures and stereoscopic rendering for DirectX 11. Unity has also teased new additions for version 4.6, which will include the new GUI. You can see more details about the new update on the official website.